When Star Wars came out in the summer of 1977, I was 20 years old. I enjoyed the movie but I didn’t get Princess Leia. Princess? Really? She didn’t look like a princess. She didn’t wear sparkling gowns to the ball. She didn’t even go to a ball! She didn’t cry when she was captured. She didn’t swoon when she was rescued. She did none of these. She took charge. She grabbed Luke’s gun and shot an escape route right into the garbage pit, and then jumped in head first. What kind of Princess does that? Truth is I don’t remember watching any shows with Princesses when I was growing up. I liked action and heroes so I watched WESTERNS! Bonanza, The Rifleman, and High Chaparral, to name a few. Handsome men and daring adventures. If you’ve seen any these series, you know that women had one role—to marry the male lead and then promptly die. Shot by a stray bullet during a gunfight was the usual culprit. That gave time for one last kiss before dying in the male lead’s arms. Sure there were the occasional barmaids like Miss Kitty on Gunsmoke, but for most women in westerns, their roles were to die. What was the reason behind these oft-repeated 60-minute courtship/marriage/death scenarios? This was the 60’s remember. Men didn’t cry on TV or in real life. Not unless they had a good reason and a dead wife was a good reason. Dead wives gave the male leads a reason to cry or seek revenge or go temporarily insane. All of which made for great TV but wasn’t much of a role model for impressionable preteen female viewers like me. 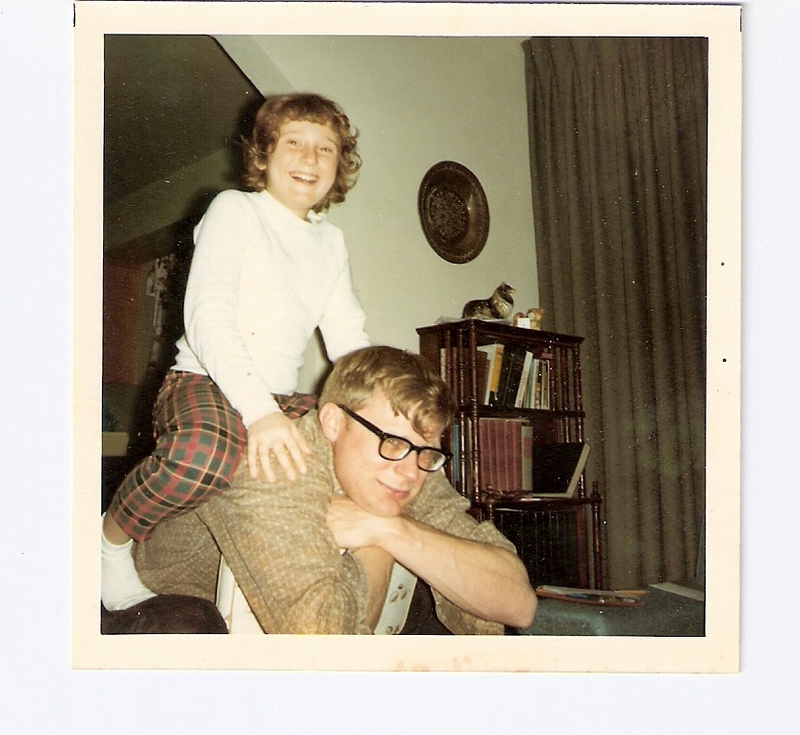 Carolyn on her big brother’s shoulders, probably watching westerns and pretending to be a cowboy. Then came Star Wars and things changed. The most popular motion picture on the planet had a pretty young Princess who wasn’t just as a plot device. She didn’t wear ball gowns or worry about her hair. She didn’t pine over a boyfriend or worry about her wedding. She was tough! She challenged the men who captured her and bested the men who rescued her, all the while never losing who she was by trying to be just one of the guys. She never lowered herself in an effort to seek popularity or approval. Forty years later, TV and movies have a slew of tough young heroines: Daenerys Targaryen in Game of Thrones, Rey and Jyn Erso in the latest Star Wars movies. And writers are emboldened to have strong female characters, too. As the author of KINGSLEY, I know a thing or two about writing powerful female characters. I have heroes and villains, scientists and tradesmen all who are women. (per the Kirkus Reviews … KINGSLEY sports “a strong cast of varied and complex women.”) It’s actually the guys that need rescuing. I like to think that Princess Leia would be proud. ← One-line summary of my novel.